A day of sunshine with temperatures in the low 70s provided ideal weather conditions for the 8th annual PPD Beach2Battleship Iron Distance Triathlon, held on Saturday, October 17. The full-distance race began with an early-morning 2.4-mile swim in Banks Channel at Wrightsville Beach, followed by a 112-mile bike ride and a 26.2-mile run. The full bike course took competitors from Wrightsville Beach, through sections of New Hanover, Pender, Sampson and Bladen counties. More than 2,300 athletes participated in the Iron and Half-Iron distance races. An estimated 8,000 spectators, comprised of friends, family, trainers, volunteers and onlookers, cheered for the triathletes along the race route from the starting point at Wrightsville Beach to the finish line in Downtown Wilmington. An additional 300 runners participated in the 2nd annual New Hanover Regional Medical Center 5K that began at the Greenfield Lake Hugh Morton Amphitheatre. A lively finish line celebration was held Saturday afternoon and into the evening along the riverfront at Port City Marina, a 25,000 square foot concrete pier along the Wilmington Riverwalk’s north end. With a dramatic view of the Battleship NORTH CAROLINA, the new marina welcomed athletes with music, food and revelry. On Sunday, a celebration/awards brunch honored the winners at the Wilmington Convention Center, which served as race headquarters. The PPD Beach2Battleship Triathlon is an internationally recognized Iron and Half-Iron distance triathlon that has been ranked among the top five iron distance events in the world by Triathlete magazine. 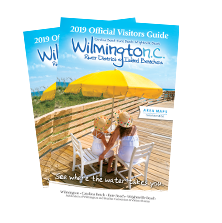 Each year, competitors from around the country and the globe travel to Wilmington and Wrightsville Beach to experience the coastal race. The USAT-sanctioned 2016 PPD Beach2Battleship Triathlon will be held in Wilmington and Wrightsville Beach on Saturday, October 22, 2016. Registration opens on November 1 and slots fill up quickly. For registration information: www.beach2battleship.com.